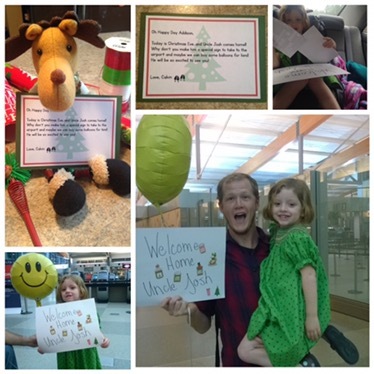 Today is Christmas Eve and Uncle Josh comes home today! Why don’t you make him a special sign to take to the airport and maybe we can buy some balloons for him! He will be so excited to see you! Addison went with Nana and Pops to pick him up. She was so excited to see him, that she ran down the hall towards him as he was walking off the plane!